With an out-of-town trip coming up, my last ride of the year was one of the newest cars on the market. I’d say there’s a kind of symmetry about that, a rarity in my usually disorganized life. The car was the 2017 Jaguar XE sports sedan, which the company calls a “true driver’s car” in adding it to its lineup last spring. The company expects big things from it in a very competitive segment that long has been dominated by German manufacturers Mercedes-Benz, BMW, and Audi. In other words, a tough market. The new XE comes with a choice of three engines with a 2.0-liter, turbocharged 4-cylinder serving as the base. It is rated at 240 horsepower and 251 pound-feet of torque. If that is too meek for you, there’s also a 3.0-liter, supercharged V6 that increases those numbers to 340 and 332, respectively, trimming zero-to-60 mph time to 5.1 seconds from the 6.5 in the base. 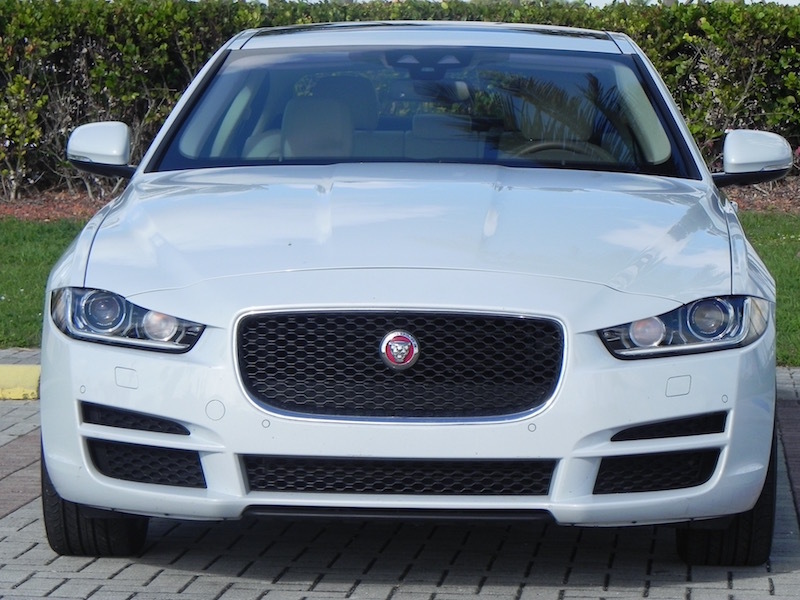 Each of the models (20d, 25t, and 35t) is available in XE, XE Premium, XE Prestige, and XE R-Sport trim levels that carry respective MSRPs running the gamut from $34,900 to $51,700. The 20d Prestige model I had for the week was listed at $46,395 including the $995 destination and delivery charge. 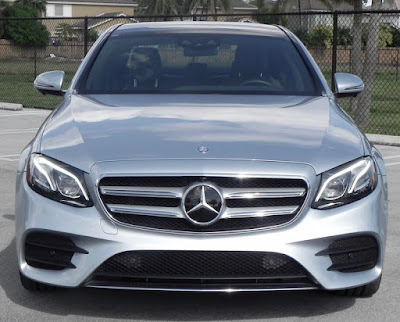 Included in that were some no-charge options — satellite radio, white metallic exterior finish, and a “Vision” package that included Xenon headlights with LED signature lighting, high beam assist, front and rear parking aids, and blind spot monitor system. 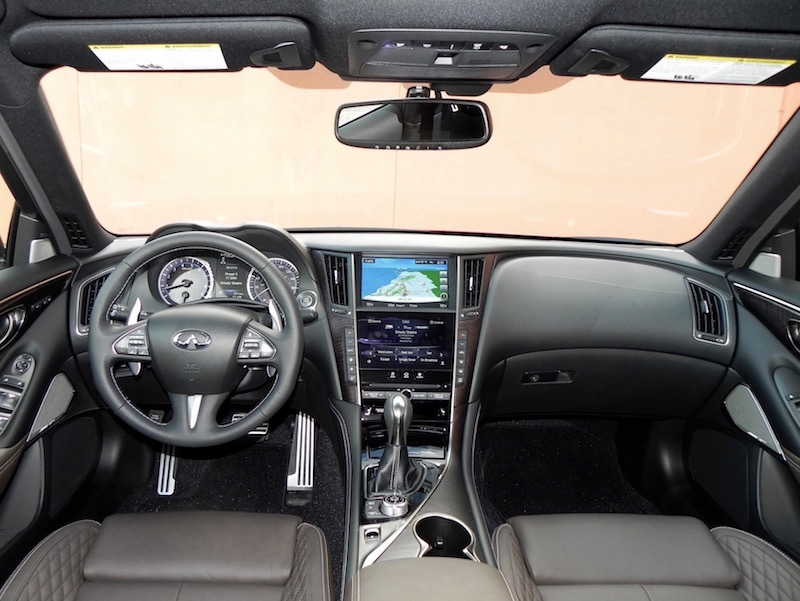 The standard equipment included 10-way power adjustable front seats (4-way lumbar) with leather surfaces and driver memory settings, keyless entry with push-button start, moonroof, rearview camera, navigation, InControl infotainment system, and a premium sound system. 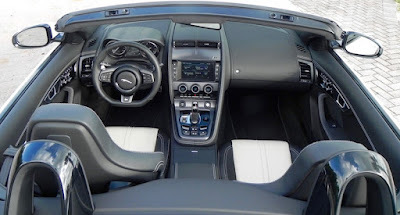 The 8-speed automatic transmission is operated via a dial that rises up from the center console when the engine is started and features a Sport mode as well as paddle shifters for manual gear selection. 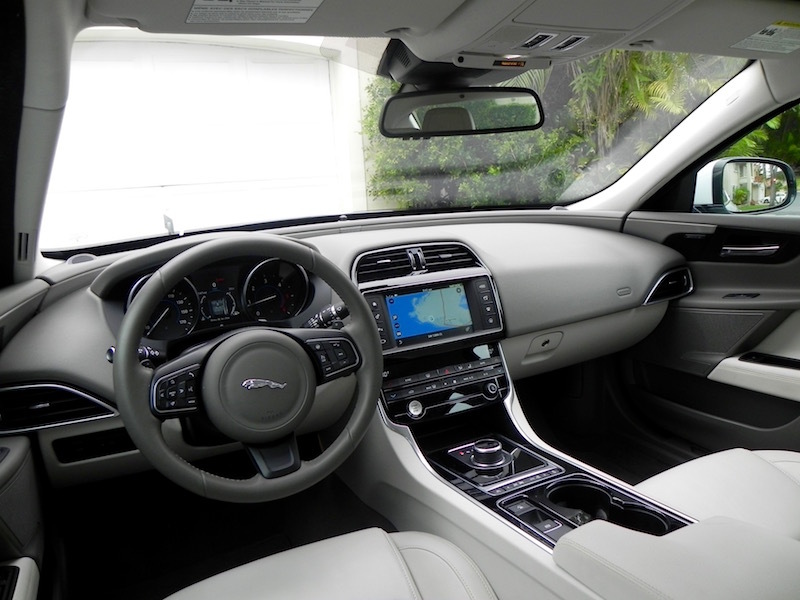 The JaguarDrive Control system offers the option of various settings to enhance performance with the dynamic setting providing sportier performance. And yes, there is also a start-stop mode to reduce fuel consumption when idling, though you can turn it off by pushing the button on the console. But you have to do that each time you restart the engine. 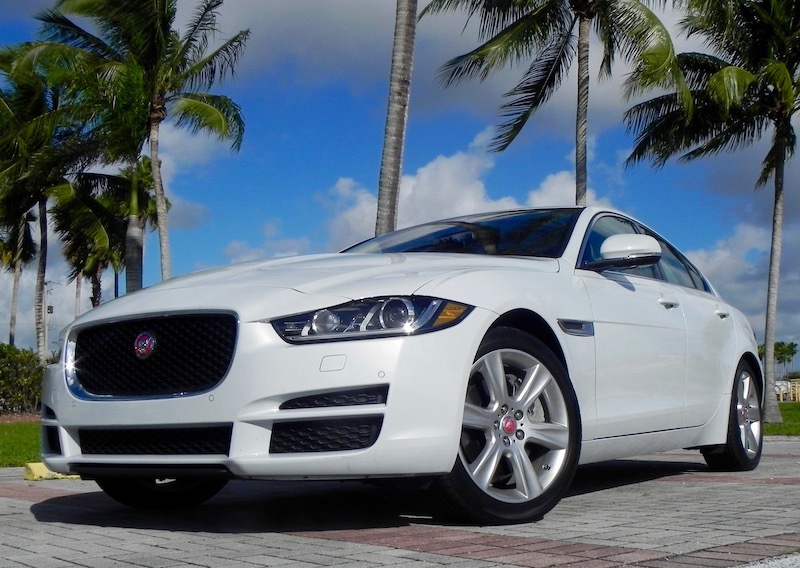 All in all, the bold, distinctive exterior and the classy, eye-pleasing interior makes the 2017 Jaguar XE a must for anyone shopping in the segment, especially those who want to stand out from the crowd. 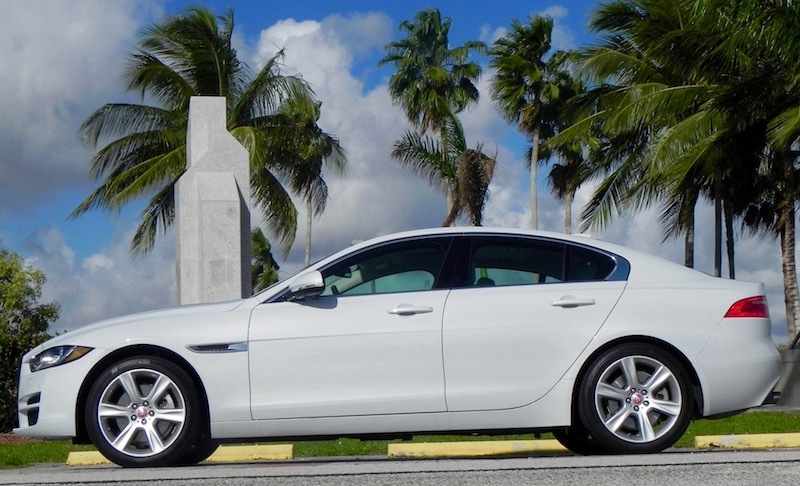 What I liked about the 2017 Jaguar XE: It has a distinctive look and character about it. Putting in destination information for the navigation system was easy enough, though some of the other functions are a bit more fussy to operate. 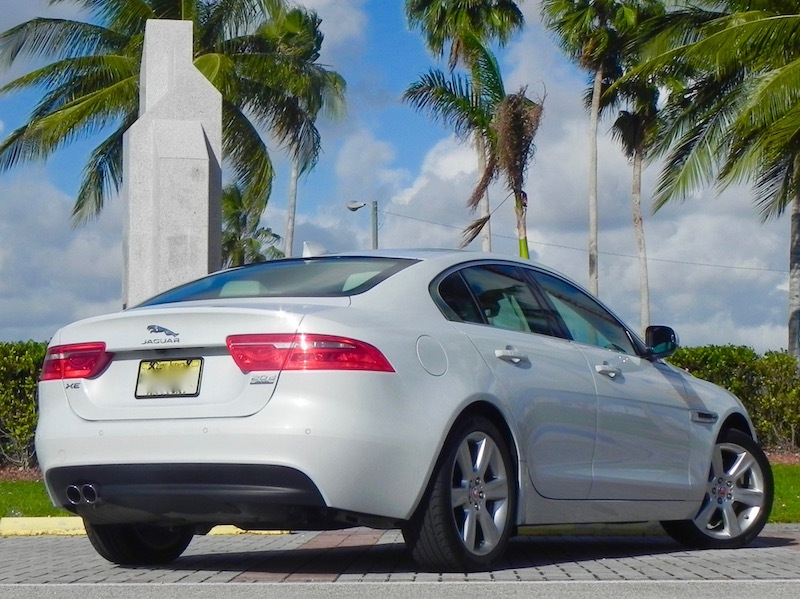 What I didn’t like about the 2017 Jaguar XE: The road noise seemed a bit excessive at typical expressway speeds. (But there was no wind noise at all.) The voice commands on the navigation system were a bit on the excessive side. Do you really need to be told that in 3.2 miles you should “continue straight” on the route you are on? 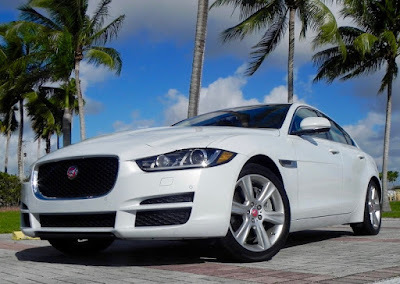 Would I buy the 2017 Jaguar XE? : Probably, but I would like to drive one of the gasoline versions. The diesel engine had kind of a low, bass sound that made it seem like it was laboring at times, which, with all that torque, certainly wasn’t the case. But it was the feel I got with it. After a full-scale redesign, the Mercedes-Benz E-Class sedan moves into its 10th generation with the 2017 model, offering a new engine, numerous technological features that include the ability to drive itself for short stints, and the kind of classy interior you typically expect from the German automaker. Little wonder that U.S. News & World Report ranks it No. 1 among 17 offerings in its analysis of the midsize luxury segment. 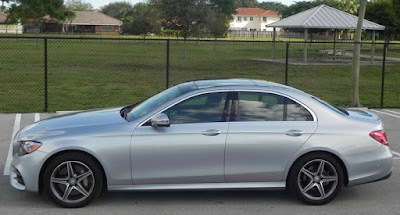 I happened to drive the 2017 E300 sedan after a couple of week-long stints in Jaguar models and was pleasantly surprised by its agility and handling. No, it didn’t match the power of the Jaguar F-Type R or F-Type SVR when it came to driving performance, but it was a quite a bit livelier that one might expect for the class. 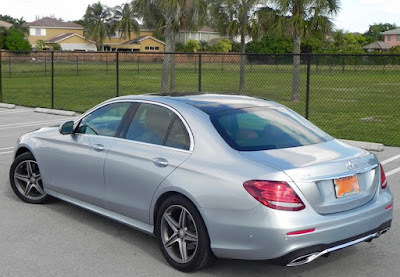 It is, after all, a sedan meant for hauling passengers and their stuff in relative comfort, but especially when set in Sport or Sport-Plus mode, the E300 delivers strong throttle responses even though the only engine offering for the E300 is a turbocharged 4-cylinder. It is mated with a nine-speed transmission and is rated at 241 horsepower and 273 pound-feet of torque. Company clockers say the zero-to-60 mph time is 6.2 seconds in rear-wheel-drive configuration and a tick slower, 6.3, for the all-wheel-drive 4MATIC. Other engine options for the sedan and updates for E-Class coupes and convertibles, which are unchanged for 2017, will come later. I mentioned Sport and Sport-Plus mode settings. There are two others, Eco and Comfort, plus a third, Individual, that allows you to pick and choose the way you want your E-Class to perform. You can set the transmission and steering, say, to Eco or Sport, while setting the suspension to Comfort for a smoother, less firm ride than either Sport or Sport-Plus provides that is usually expected by buyers in the segment. The Individual setting also allows you to permanently turn off the automatic shutoff feature that kicks in when you come to a complete stop at an intersection or in stop-and-go traffic. If you don’t do that, you have to manually turn the function off by pressing a button each time you stop and restart the car. Frankly, I find the feature somewhat annoying, and turning if off -- when I can -- is something I do, dare I say, automatically. Apparently, though, the automatic start/stop system does save fuel, up to 3-5 percent according to a New York Times piece that ran last spring. Though the same story quoted one driver as saying he estimated his savings at about a mile-per-gallon. According to the federal government, mileage figures for the E300 turbo-4 are 22 miles-per-gallon city, 30 highway, and 25 combined using premium fuel, of course. 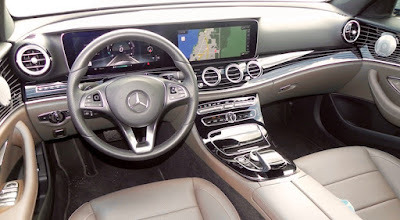 Among standard features on the E300 are navigation, 18-inch wheels, keyless entry with push-button start, a sunroof, LED headlights, dual-zone automatic climate control, synthetic leather upholstery, tilt-and-telescoping steering wheel, wood interior trim, and the company’s COMAND system for operation infotainment systems. Wi-Fi, Bluetooth phone and streaming audio, HD Radio, two USB ports, Apple CarPlan and Android Auto also are included. Voice-operated systems respond fairly accurately to most commands, but with the delays in responses, you’re really can accomplish most changes faster by using the controller on the center console, though that involves getting the display screen in the correct mode (i.e., switching from audio to navigation, for example). Things like a rearview and surround-view camera, adaptive cruise control, automated parallel parking system, front seats with massage systems, front-collision warning system, premium audio and more are offered in option packages. Of course, the E300’s interior has a classy appearance with lots of high-quality materials in evidence. It is a Mercedes-Benz, after all. One really nice thing designers managed to do, however, is incorporate the large, 12.3-inch display screen into the flow of the dashboard rather than leaving it sticking out above the center stack as the case is with some of the models from their competitors. Instead of looking like an afterthought, it’s like they gave some attention on how to do this. A slight overhang over the screen also helps alleviate the glare problem on sunny days. Pricing for the 2017 Mercedes-Benz E300 starts around $52,000. Can’t give you the exact cost of the model that served for my test drive because it was so new the Monroney sticker wasn't available. I’m guessing it was quite a bit more with all the features that were included. 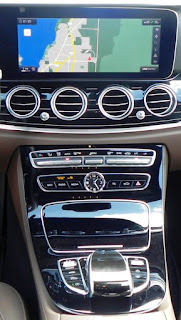 What I liked about the 2017 Mercedes-Benz E300: The big touchscreen provides a clear, detailed map for the navigation screen, which, as I noted earlier, is nicely incorporated into the flow of the dash. The seats are comfortable, the cabin quiet, and the exterior more striking in appearance than its predecessor. What I didn’t like about the 2017 Mercedes-Benz E300: It took a while to link my cell phone up, and some extra steps are required to complete some of the infotainment functions. But engineers seem to be dumbing down the systems so even the technologically challenged (ahem!) can manage. The trunk capacity (13.1 cubic feet) isn’t up to some of its competitors. Would I buy the 2017 Mercedes-Benz E300: Yes. Don’t let the 4-cylinder engine lull you into thinking it’s going to be underpowered. It is definitely not that. If you follow this blog on even a casual basis (and, of course, you do! ), you no doubt are aware of my fondness for convertibles and also that my favorite car of the moment is the Jaguar F-Type. For more details on that, you can read my recent review of the F-Type Coupe posted just a couple of weeks ago. 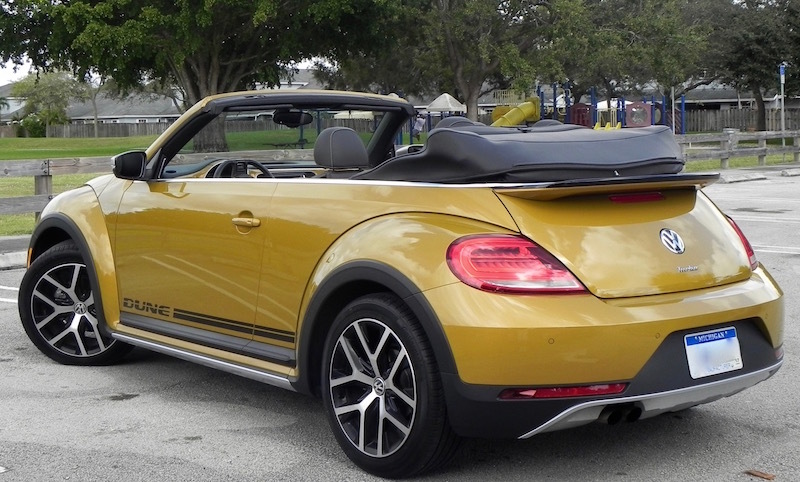 So you can imagine how I feel about the convertible version. Yes, this is a tough job, but somebody has to do it. 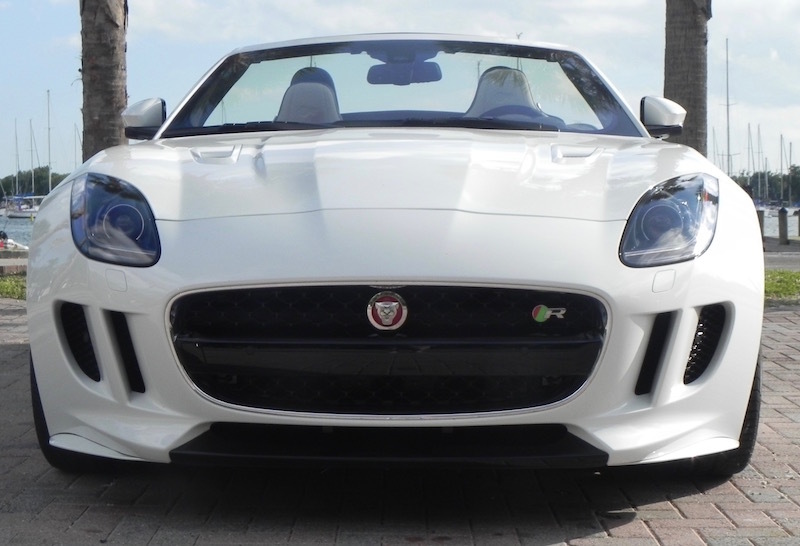 The R is one of two F-Type trims (the new SVR being the other) that get a 5.0-liter supercharged V8 engine instead of the supercharged V6 found in the base, Premium and F-Type S models. 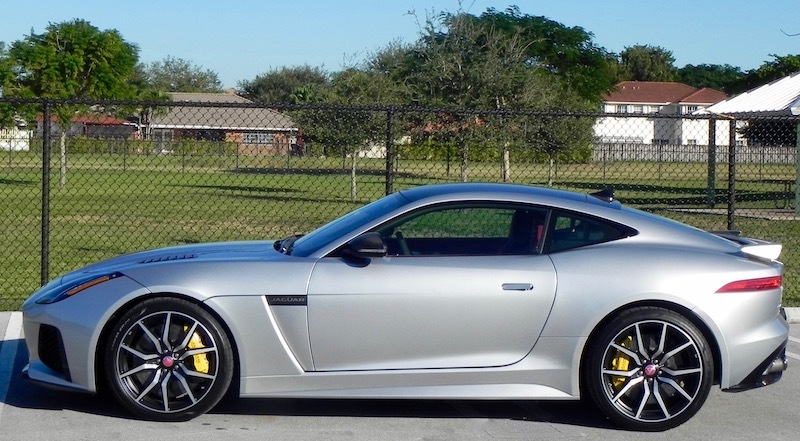 It delivers 550 horsepower and 502 pound-feet of torque, which is a good bit more than even the V6 in the F-Type S, which checks in at 380 hp and 339 lb.-ft. of torque, but not quite what the SVR version delivers. The SVR tops out at 575 hp and 516 lb.-ft.
I’m thinking that 550/502 is going to be adequate for most tastes. Edmunds.com clocked the F-Type R’s zero-to-60 time at 3.5 seconds. Do you really need to go quicker? The V8 is mated to an eight-speed automatic transmission with a sport mode and paddle shifters for manual gear selection and comes in all-wheel-drive configuration only. EPA numbers are 15 miles-per-gallon city, 23 highway, and 18 combined using premium fuel, which are not endearing figures to Sierra Club types. I’m not going to get into too much into the nitty-gritty of the F-Type R Convertible because much of what I wrote in November about the F-Type SVR Coupe applies to the droptop as well. Infotainment systems all work the same, and standard and optional equipment lists are pretty much identical. There are two major differences, one being the fabric top on the convertible that lowers and raises with a tug of a switch on the center console. The raising and lowering operation, including raising or lowering the windows, is accomplished in a matter of seconds, giving you enough time to pull off the expressway and get the top back up if you happen to get caught in an unexpected shower. The other obvious difference is in the luggage space. The coupe offers only 11.0 cubic feet, which is on the tight side but seems generous when compared to the convertible’s 7.0 cubic feet. Not only is that stingy, the way it is configured to accommodate the rear wheel wells cuts down on your packing ability as well. With room for only two and the small trunk, this is not a car built for a family or for long trips with lots of suitcases. This is a car meant for fun, and we’re not necessarily talking about a skirt-the-edge-of-traffic-laws experience. In addition to the acceleration, the F-Type R delivers much in the way of cornering and sure-footedness, and the notes from the dual-quad exhausts are, well, the word “awesome” comes to mind, especially when Dynamic mode is activated. In addition to the full-throated roar when the gas pedal is pushed, you get rapid-fire crackles the car gears down when you lift your foot from the pedal. Oh. There is one other big difference. The F-Type SVR Coupe I had in late November came with an MSRP of $126,945, including the $995 destination and delivery charge, and the SVR Convertible lists for a bit more at $129,775. 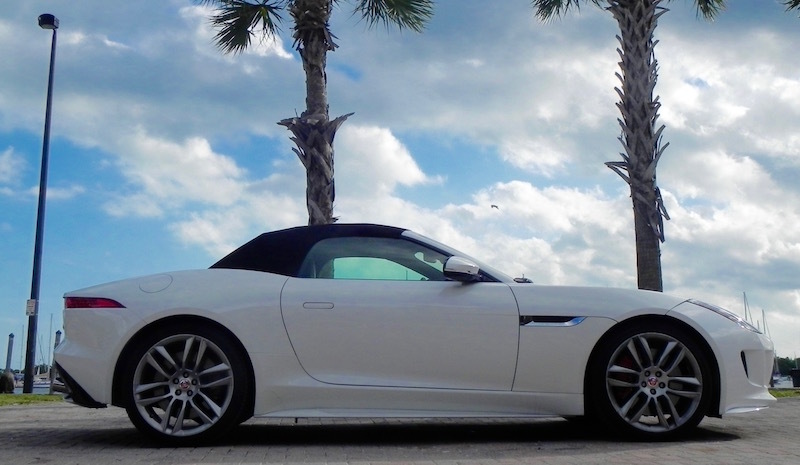 The F-Type R Convertible, which has many of the same attributes as the SVR, lists at $109,245. Maybe that doesn’t mean much to those who are accustomed to doing their car shopping in the six-figure range, but it seems like a pretty good jump to me. 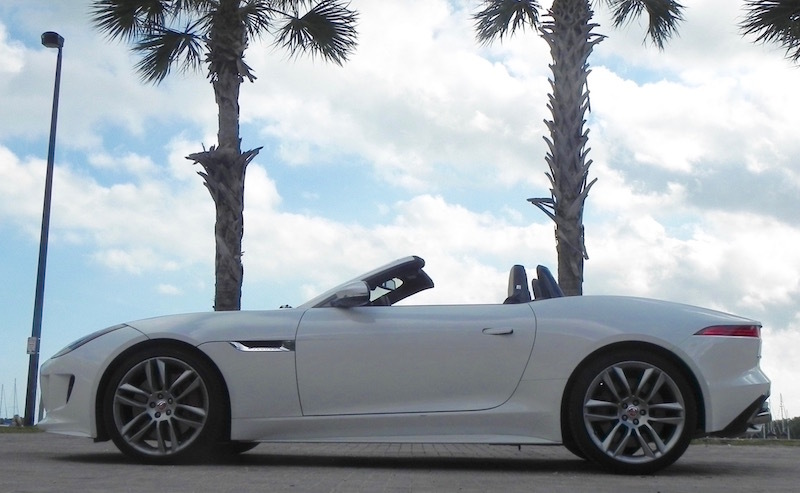 What I liked about the 2017 Jaguar F-Type R Convertible: Performance is a joy for all senses, even touch and hearing, and luxury features like 14-way power adjustable leather seats add to the overall driving experience. I preferred the leather-wrapped steering wheel in the convertible over the suede cover on the coupe’s wheel. The blind-spot monitor is a must what with the restricted view to the rear in the convertible. 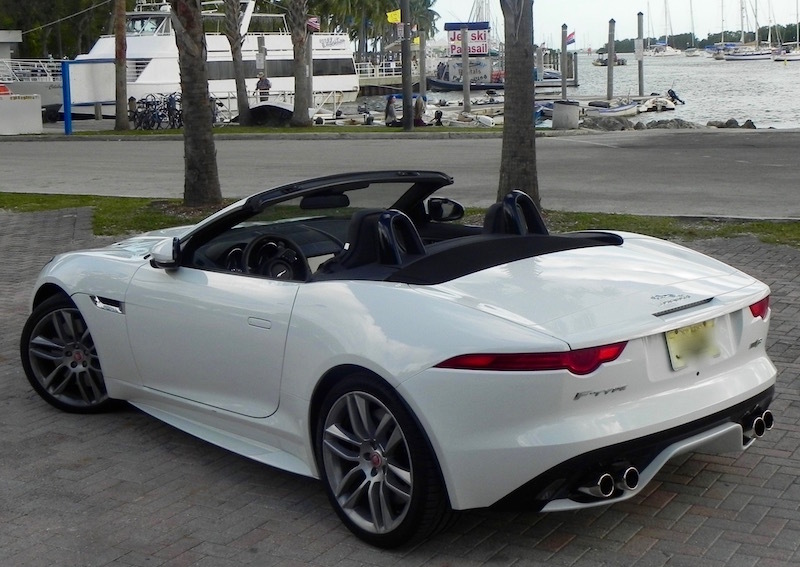 What I didn’t like about the 2017 Jaguar F-Type R Convertible: The trunk is very small and oddly shaped, but at least you don’t lose any space when the top is lowered. There’s not a whole lot to lose! 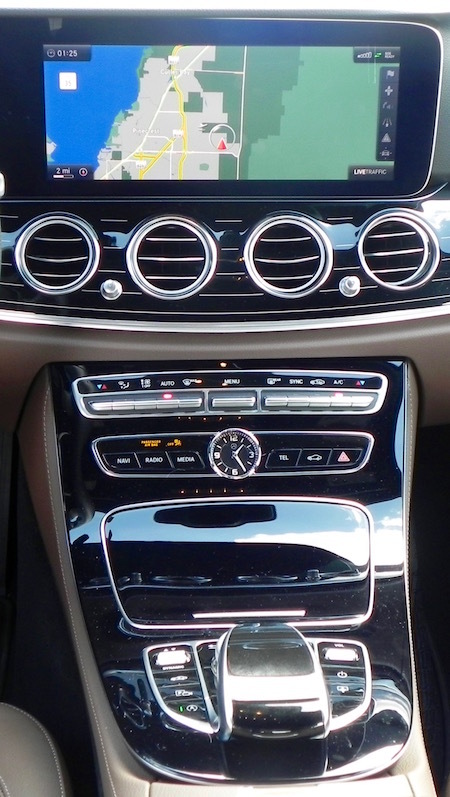 The infotainment system can be fussy to operate. 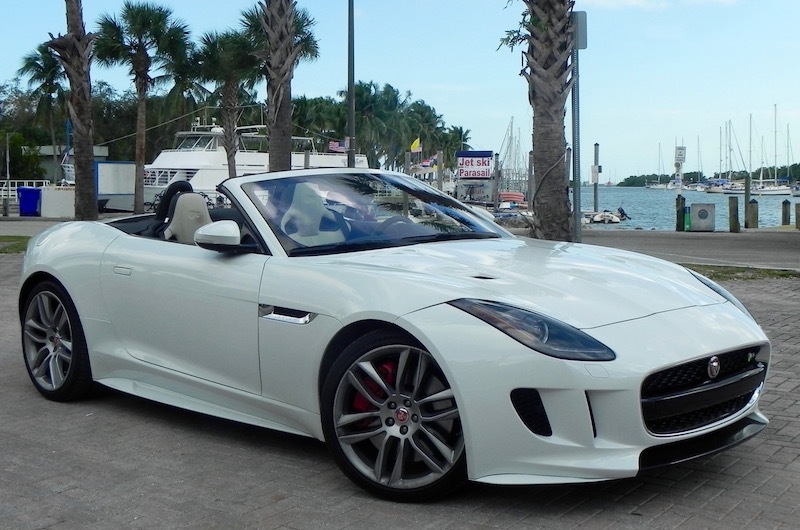 Would I buy the 2017 Jaguar F-Type R Convertible: Yes. I would go with the R over the new, top-of-the-line SVR model because I don’t think there is a $20,000 difference between the two. The website for Kelly Blue Book (www.kbb.com) breaks down new cars into an even dozen categories with links to lists of sedans and coupes, crossovers and SUVs, hatchbacks and convertibles, hybrids and electrics, vans/minivans and wagons, and luxury and trucks for shoppers to peruse. A good friend of mine would like to make it a Baker’s dozen and add a 13th category. We’re not talking here about 1/25th scale models that decorate shelves and desks of auto aficionados but vehicles that you can drive on the streets and highways in town and country. Yes, real cars but with a twist. David got this idea a few years ago when he was trying to contort his 6-foot-1, 200-pounds plus (his numbers) frame into the bucket seat of an Acura NSX. He had no trouble getting in and out of a Corvette or Mustang or even a BMW Z3 and Mazda Miata, he said, but the NSX was like trying to get behind the wheel of one of the old stamp-wheeled toy pedal cars of the 1950s or the Power Wheels of today. A tight squeeze. Thus the NSX, he determined, was a toy car. Later, he expanded that definition to encompass vehicles that don’t necessarily fit into a specific set of specifications like length, width or seating capacity (though most are small) and aren’t necessarily difficult to get in or out off, but have a distinct aura about them that exudes an essence of pure automotive fun. The Volkswagen Beetle, especially in convertible configuration, is one such car. In fact, just to emphasize its spirit and carefree soul, when the New Beetle came out several years ago it was equipped with a strange vial-like tube attached to the dash that was about the thickness of a dime (or maybe a nickel — it has been a while). Frankly, I couldn’t figure out what the heck it was (change for tolls?) until somebody told me was a bud vase similar to the porcelain one that was offered as a dealer option back in the 1950s. If flowers don’t say “toy car,” nothing does. 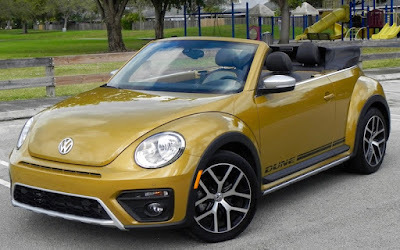 As such, I would say that doesn’t make the 2017 VW 1.8T Dune Beetle Convertible a very good option for a family, unless that family is downsizing, but it does make for kind of a fun second vehicle for special excursions or even regular commuting in city traffic. It is one of two new Beetles offered for 2017 along with a limited edition #PinkBeetle Convertible that comes with an purplish exterior that VW calls Fresh Fuchsia Metallic and pink accents on the interior. That would seem to be taking “toy car” to the extreme. But we are dealing with the Dune here, not the #PinkBeetle. The Dune comes with a 170-horsepower 1.8-liter turbo 4-cylinder engine that with 184 pound-feet of torque kicking in at 1500 rpm gives a pretty sprightly driving performance. 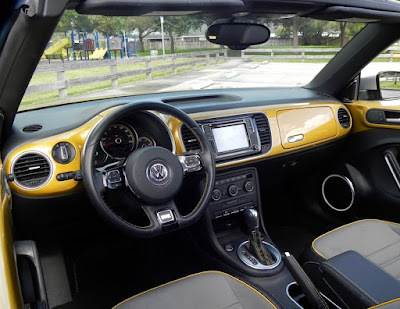 The six-speed automatic transmission features a “sport” mode and gears can be selected manually, but without paddle shifters to accomplish that that’s a chore that is best skipped. It’s good only if you want to hold it in third or fourth gear, say, to keep engine revs up for quicker throttle responses. Mileage figures for the Dune are 24 miles-per-gallon city, 31 highway and 27 combined using regular fuel. What makes the Beetle Dune “dune” is that it sits slightly higher and is slightly wider than the base 1.8L Beetle, albeit less than a half-inch in either dimension, giving it what the Germans consider a “more rugged” stance. The exterior gets new front and rear fascias and the side gets black strips and special “Dune” markings. It’s available in three colors, though the Sandstorm Yellow seems to be a more logical choice than either the Pure White or Deep Black Pearl. The brownish hue seems to fit “dune” more than black or white. 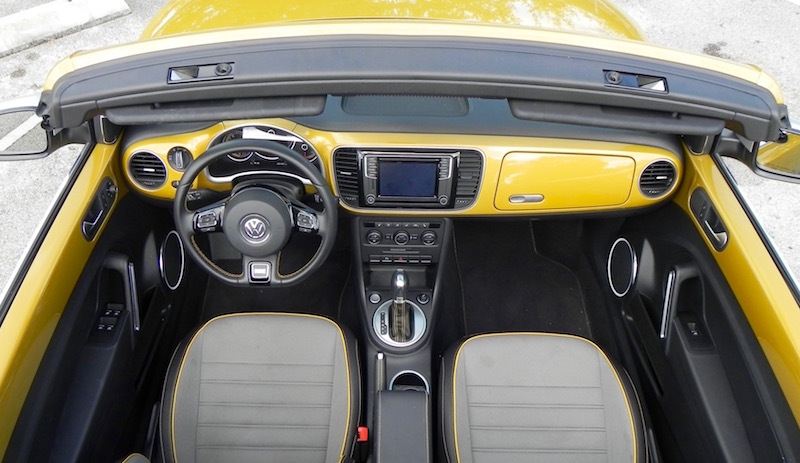 Inside, the Dune gets sports seats that feature yellow stitching and a leather-wrapped steering wheel. The seats are comfortable, adjustable manually, and — as is typical of many convertibles — spacious enough in front but tight in the back. Getting to the rear seats with the top up requires similar contortions to what David experienced with the NSX. Two electric motors raise and lower the top, which latches and unlatches automatically so manual securing of the latch is not required. The operation takes only 9.5 seconds to lower and 11.0 to raise and secure and can be done at speeds up to 31 mph, which is good if you get caught in a sudden shower. 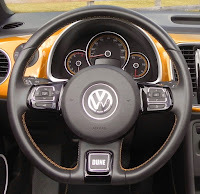 Standard equipment on the Dune included a rearview camera 18-inch alloy wheels, automatic headlights, a power-operated insulated top, heated front seats with lumbar support, SiriusXM satellite radio, and an infotainment system that includes Bluetooth, VW Car-Net App-Connect, and a Park Distance Control (Park Pilot). In a real shocker, floor mats are listed among standard equipment, which means the salesman can’t act like he is doing you such a big favor by throwing them in with your deal. That comes with an MSRP of $29,395. With a technology package (Fender premium sound system, keyless entry and push-button start, and dual zone climate control) for $995 and the $820 destination and delivery charge added in, the total cost for my test vehicle was $31,210. Too much for a Beetle? 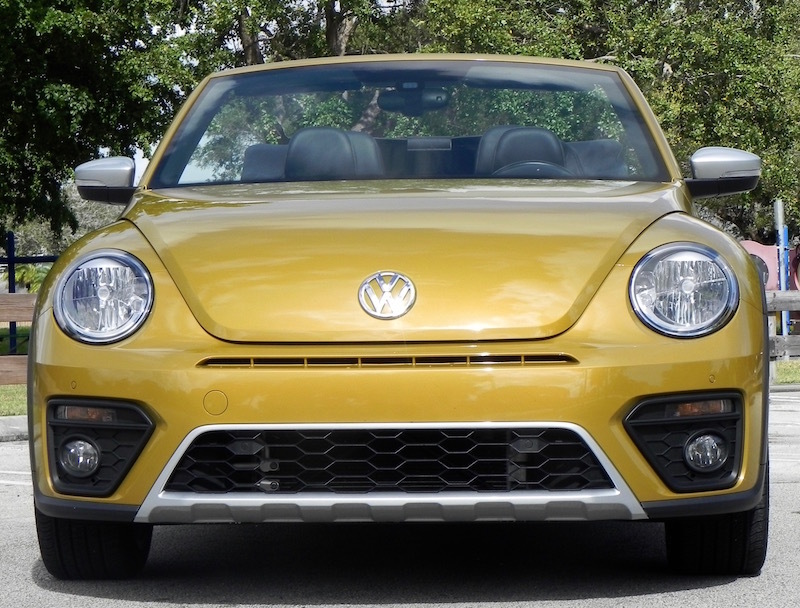 MSRP for the 1.8T S Beetle is $25,565 and the 1.8T Beetle Classic checks in at only $270 higher than that. The 1.8T SEL sits at the top of the line with an MSRP of $32,115. 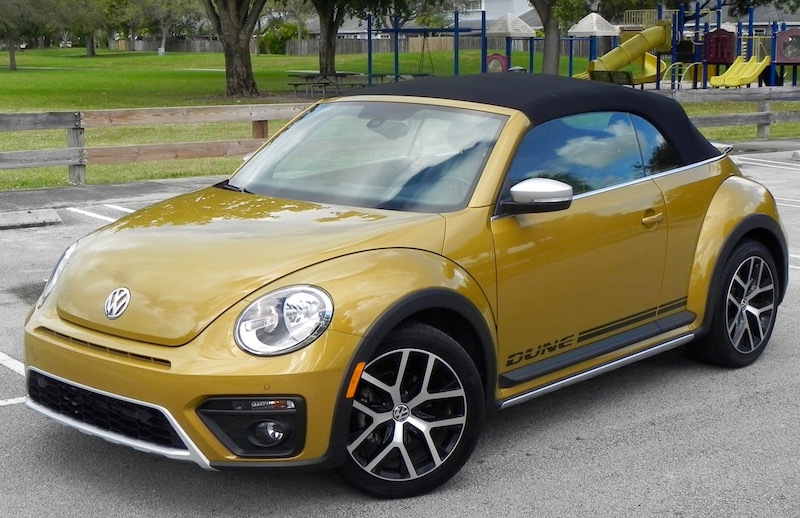 What I liked about the 2017 Beetle Convertible 1.8T Dune: It’s got a sporty feel to it when it comes to handling. Also, with the insulated top up, it is very quiet on the road even at highway speeds. 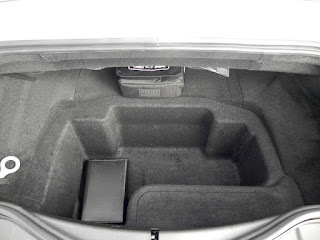 With the top down, you don’t lose any trunk space, but you don’t get a lot to begin with (7.1 cubic feet). 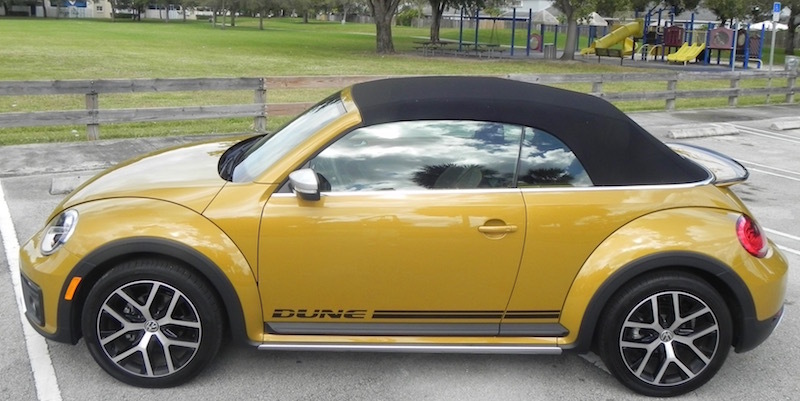 What I didn’t like about the 2007 Beetle Convertible 1.8T Dune: Response to voice commands for the radio are erratic. By the time you repeat the command two or three times, you might as well make the station change manually. It’s quicker. You don’t have to do it, of course, but after lowering the top, to finish it off you have to tug and push to snap a boot cover in place. Welcome to the 1990s! Would I buy the 2017 Beetle Convertible 1.8T Dune: As a fun second car, I’d certainly give it consideration. It’s a tough question to answer because there are so many things involved in the issue. I also wouldn’t want to tell someone to buy a (blank) and then have them got hold of a lemon. Certainly if you read enough reviews by actual buyers you’ll find some panning some vehicles for problems they have had with them but other owners love. Years ago at an event sponsored by another manufacturer I heard someone say he always recommended a Camry because of Toyota’s reputation for reliability and it was good-looking as a “safe” choice. This was long enough ago that there once was a big quality gap between the Japanese automaker and many of its competitors. Now that that gap has closed, I’m not sure what this guy would recommend, and I have long since forgotten who it was who said it so I can’t ask. Just take my word for it. Frankly, I haven’t been asked that question very often, but what I have heard could be a very close second. That, too, is a tough one. When you drive up to 50 new cars every year you run across things you like about a lot of them. Though cars on the market today have some areas about them (many, in rare cases) I don’t particularly like, as a group the quality is unmistakably better than in the past, and even the less expensive models come with features that make for a pleasant driving experience. But I do have a favorite. If pushed to answer that question, as I once was at a meeting with featuring representatives of another company, I go with the Jaguar F-Type, which debuted as a convertible for the 2014 model year and a coupe a year later. That doesn’t mean it is without flaws, as I will note later. It’s just that to me the overall package of looks, performance, and gee-whiz factor of the F-Type make it the current No. 1 with me. Notice that I did not mention practicality or functional among its traits. With only two seats and a small luggage space — 11.0 cubic feet for the coupe, 7.0 for the convertible — it’s not what you call a good car for a family. Even with the new entry-level Base trim with a supercharged V6 engine instead of a V8, the F-Type is a bit much for that market. This is especially so in the new for SVR trim level introduced for 2017. An ultra-high performance coupe that served for my week-long test drive, the F-Type SVR comes with a supercharged 5.0-liter V8 engine that is rated at 575 horsepower and 516 pound-feet of torque and is mated to an eight-speed automatic transmission with paddle shifters for manual gear selection. The website zeroto60.com has yet to release a zero-to-60 time for the 2017 F-Type SVR, but you can expect it to be a bit quicker than the 3.3-second clocking for the 2016 F-Type R with all-wheel drive. In other words, quick. And if you want a little more in the way of oomph, you can set the transmission to Sport mode and other settings to Dynamic to emphasize a sportier performance. After all, that’s what this vehicle is all about. Of course that likely will cost you some when it comes to fuel mileage, which is 15 miles-per-gallon city, 23 highway, and 18 combined with premium fuel required for the all-wheel-drive SVR. You just have to sacrifice something here. Naturally, being a Jaguar, the F-Type has a lot of creature comforts. You can adjust the side bolsters on the leather seats for a more snug feeling. You might find those seats on the firm side, which some reviewers have noted could cause some discomfort on longer trips, but I never took a longer trim than the 20 miles or so from my house to downtown to confirm that. 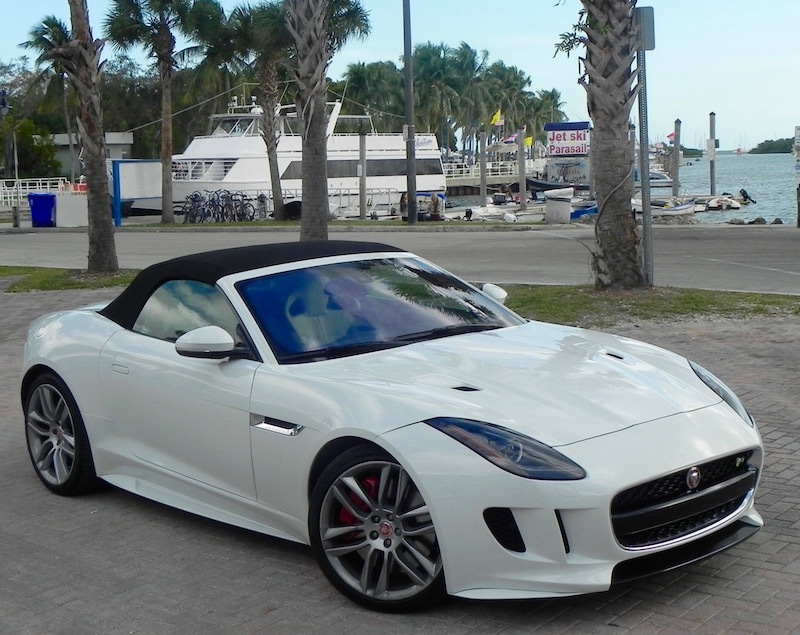 If you’re used to luxury cars that seem to “float” along, the F-Type probably isn’t going to be on your shopping list. The engine also emanates a very distinctive base beat from the dual quad exhausts that is pleasing to the ear to most, but maybe not all. It doesn’t interfere with the sound levels from the premium 770W Meridian audio system, though. As is regrettably the custom with Jaguar models, some of the technological features seem to be about a half-step behind that usually found in the class. I’m an inveterate spinner of the dial when it comes to the radio, but the F-Type doesn’t have a dial so that does make it difficult. 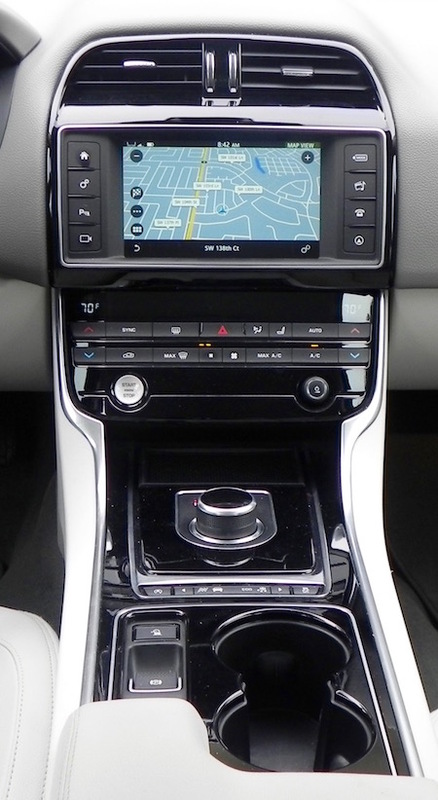 The standard navigation system is different from the one I recently contended with on the Jaguar F-Pace SUV (see October blogs), and that is good since it is more intuitive to operate and has no “mystery” settings. 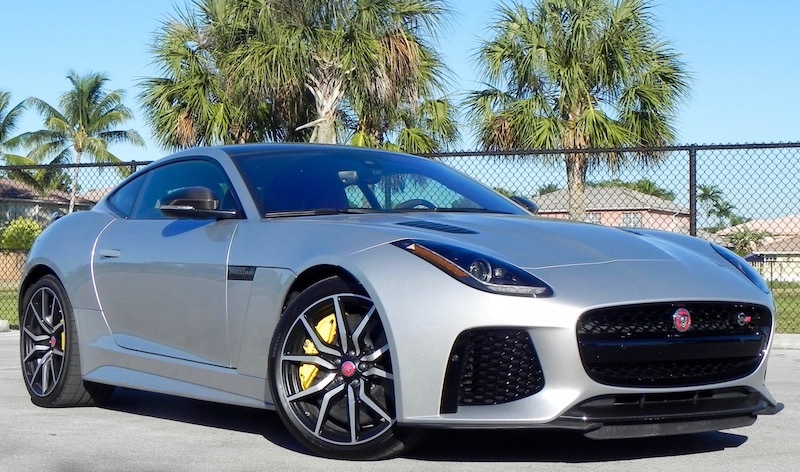 Most, if not all, of the niceties you would want in a luxury car are either standard on the 2017 F-Type SVR or are offered as “no charge” options. 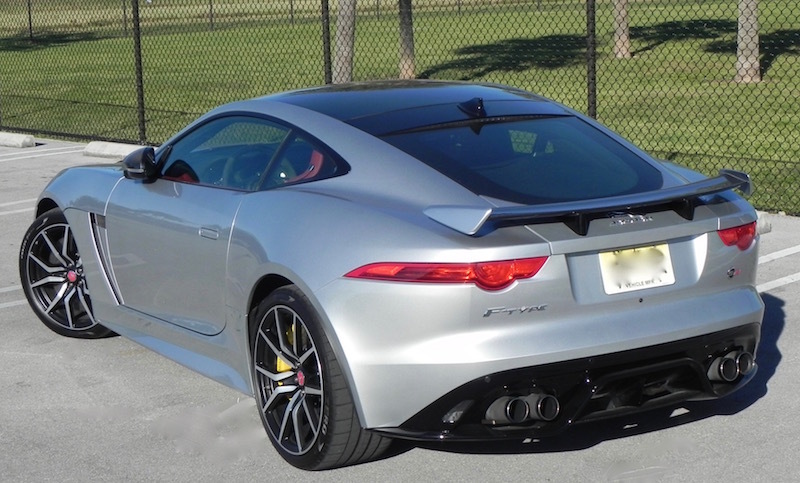 The latter group on my test F-Type included a carbon fiber center console, suede-cloth covered steering wheel, red leather interior package with red seat belts, carbon ceramic brake system and 20-inch wheels with carbon ceramic brake rotors and yellow calipers, and an exterior carbon fiber package that included carbon fiber hood louvers, mirror caps, front spoiler, side vents, and Venturi blade. Standard features included the usual package of safety features (air bags, stability control, plenty of airbags), Xenon headlamps with LED signature lighting, tire pressure monitoring system that shows pressure on each of the four wheels, panoramic sunroof, keyless entry, touchscreen navigation system, parking sensors, rearview camera, blind spot monitor, and a power liftgate for the trunk. All that is wrapped up with an MSRP that, including the $995 destination and delivery feel, checks in at $126,945, which is a bit more than what I paid for my house 23 years ago. But as I always say, you can sleep in your car (though in a two-seater it would be uncomfortable) but you can’t drive your house. What I liked about the 2017 Jaguar F-Type SVR: The throttle response, the engine sound, the way you sit snug behind the wheel, the beautiful, powerful-looking exterior, the confident feeling on the road, the quilted leather seats with adjustable side bolsters, um, need I go on? 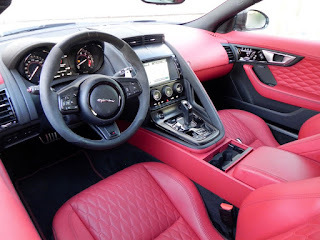 What I didn’t like about the 2017 Jaguar F-Type SVR: As silly as it may sound, it took me a while to adjust to the suede-wrapped steering wheel. It seemed a bit slick to my fingertips, which gave in to a somewhat less secure feeling when it came to control. I was getting more used to it by the end of the week, but I still prefer more conventional leather-wrapped steering wheels. 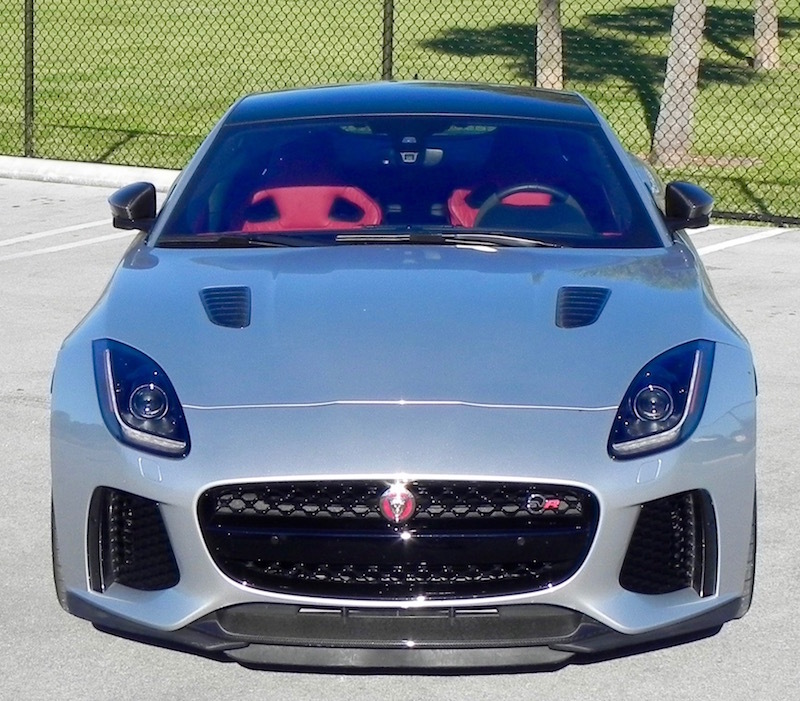 Would I buy the 2017 Jaguar F-Type SVR: What do you think? When it comes to getting creative with names for its models, you’ve got to hand it to Volkswagen. Possibly no other automaker in the world (though I’m not familiar with makes from China) comes up with as many names that evoke a what-in-the-world-does-that-mean? reaction as the game German manufacturer. Over the years, we have seen the likes of Routan, Corrado, Scirocco, Eos, Jetta, Phaeton, Tiguan, and Tourag roll off its assembly lines. What Teutonic taskmaster came up with those labels? And how? Plus there are Beetle, Fox, Golf, and Rabbit, the latter two having swapped names depending on the year and market. At least we know what those are. Perhaps it has been around long enough and is popular enough that you may know that the name “Passat” comes from German for “trade wind.” It’s also a sailing ship, and “Passat Nunatak” also is a glacial island in Antarctica. At least that’s what a cursory search on the Internet reveals, and everybody knows the Internet doesn’t lie, right? 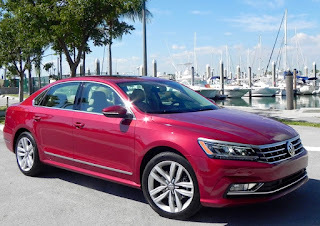 I’m just guessing here but I would think that VW had “trade wind” or “sailing ship” in mind when it named its midsize family sedan Passat, not the frozen island at the bottom of the world. 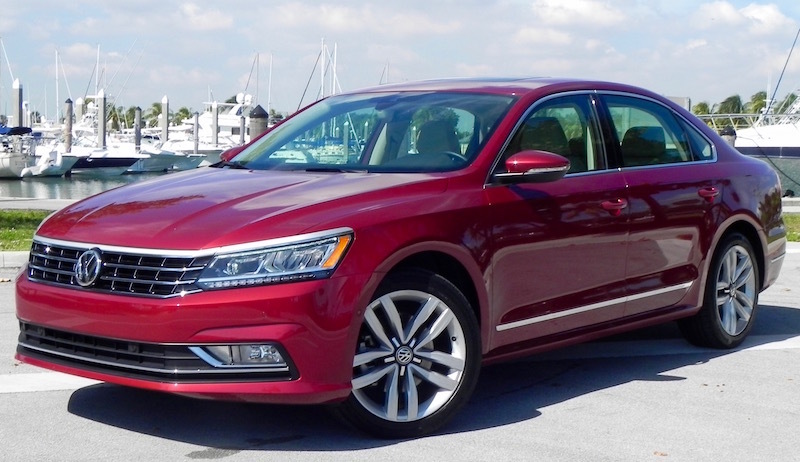 Whichever, the Passat has something to offer buyers who like to think outside the box from the traditional sedan offerings from Toyota, Honda, Chevy, and Ford. It seats five passengers comfortably enough, giving those in the backseat up to 39.1 inches of legroom, has enough oomph (280 horsepower and 258 pound-feet of torque with the 3.6-liter V6 under the hood and using premium fuel) to satisfy daily driving requirements while delivering decent fuel economy (23 miles-per-gallon combined with the V6), and produces a quiet, smooth ride with minimum road noise. 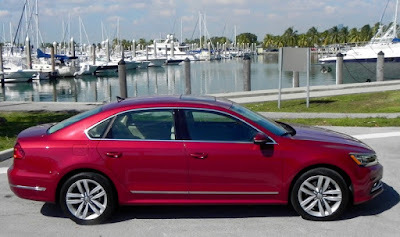 Even the 1.8-liter turbo 4-cylinder power plant under the hood of the 2017 Passat SEL Premium model that served me for a week offered decent acceleration. It’s rated at 170 hp at 6200 rpm and 184 lb.ft. of torque at a low 1500 rpm while producing fuel economy of 25 mpg city, 38 highway (a number approaching hybrid status), and 29 combined on regular fuel. Unless you are looking for a sportier performance, the 4-banger seems quite suitable. Both engines are mated to a six-speed automatic transmission with power going to the front wheels. 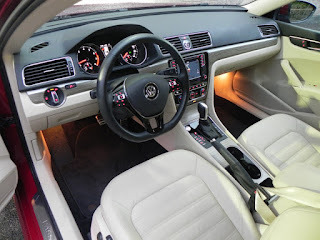 The interior of the Passat I would describe as “functional.” It doesn’t have the panache of German luxury models from Audi, BMW, or Mercedes-Benz, but there is a “European” feel about it. The quality of the materials is excellent. 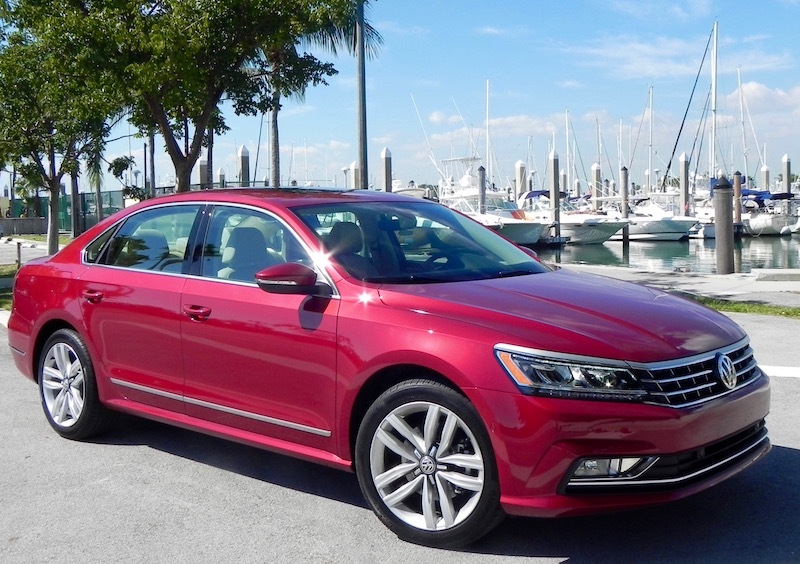 The 2017 VW Passat is offered in four trim levels starting with the S and continuing with the R-Line, SE, and top-of-the-line SEL Premium, dropping the SEL line. Forward Collision Warning and Autonomous Emergency Braking are now standard across the line. 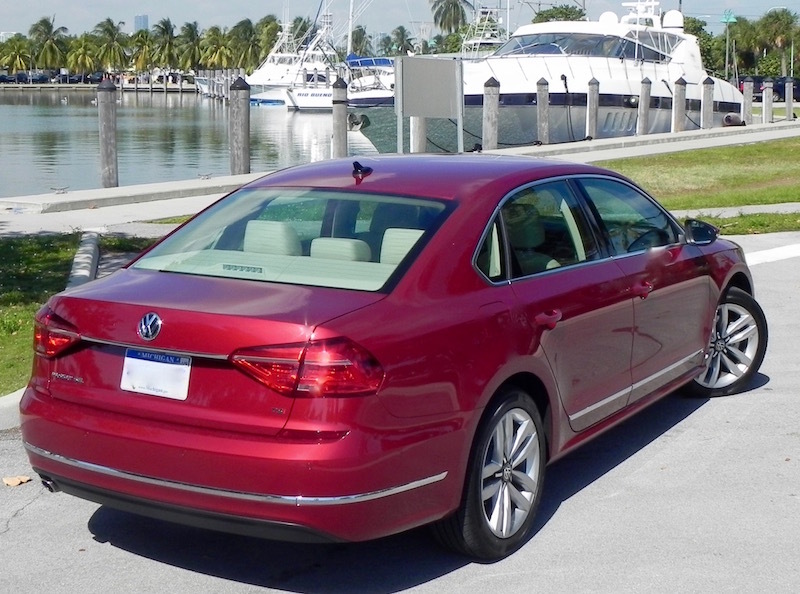 The SEL Premium model for my drive also included as standard equipment 18-inch alloy wheels (over 16s), power sunroof, dual zone climate control, park distance control with rearview camera, blind spot monitoring with traffic alert, keyless entry with push-button start, Fender premium sound system, satellite radio, VW Car-Net connectivity with navigation and Smart phone integration, lane departure warning, fog lights, and LED automatic headlights, daytime running lights and taillights. All that is included in the MSRP of $35,090 (including $820 destination and delivery), making option packages virtually unnecessary. 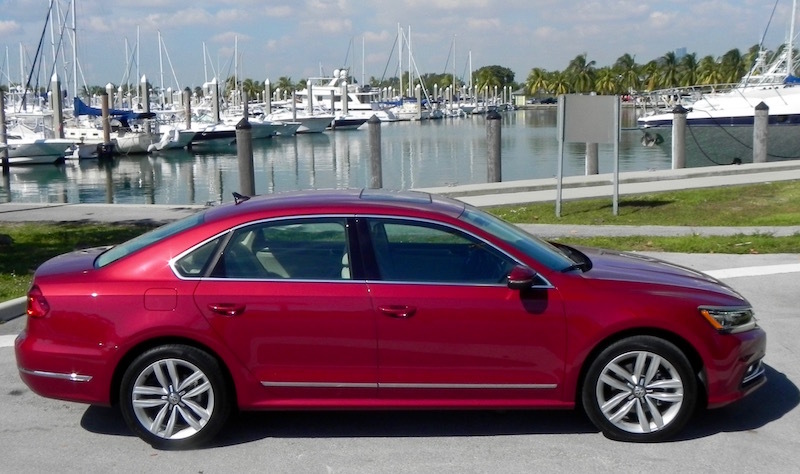 What I liked about the 2017 VW Passat 1.8T SEL Premium: It was very comfortable to drive and offers a lot of niceties in the base MSRP. The backseat is roomy and the trunk capacity is a generous 15.9 cubic feet and arranged in an easy-to-load configuration. What I didn’t like about the 2017 VW Passat 1.8T SEL Premium: The navigation screen is on the small side (6.3 inches) and responses to voice commands vary in time. 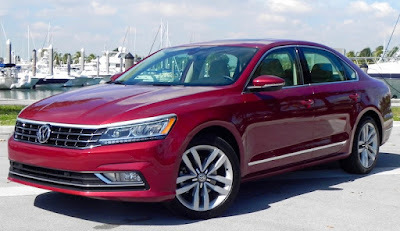 Would I buy the 2017 VW Passat 1.8T SEL Premium: In a manner of speaking I already have since several years ago we bought a VW Passat wagon and have really liked it. 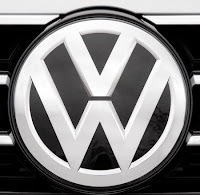 Of course, there is a major difference in a sedan and wagon (no longer offered as a Passat), but one of the things we appreciate is the German engineering. Routan: A minivan with the name derived from “route” and “an,” the latter following the company policy for its European vans Touran and Sharan. Corrado: A hatchback from the early 1990s with a name based on the Spanish word for “jet stream” or typhoon. Or maybe it’s based on the Spanish word “Correra,” to run or the runner. Seems to be some doubt there. Scirocco: From a hurricane-force wind that originates in the Sahara. Eos: The Greek goddess of the dawn. Phaeton: Named after the Greek god of the sun. Tiguan: A combination of “tiger” and “leguan,” the German words for tiger and iguana. Tourag: A nomadic people in the Sahara. 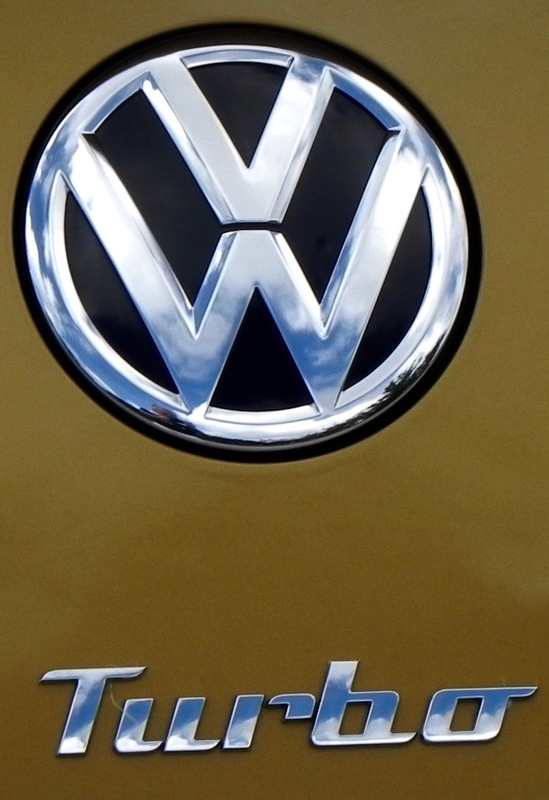 Of course, Volkswagen itself is German for “the people’s car.” But you probably knew that. I like red cars. Unless you count a maroon Ford Falcon Sprint convertible I had back in the mid-1960s, though, I’ve never owned one, but I do like them. 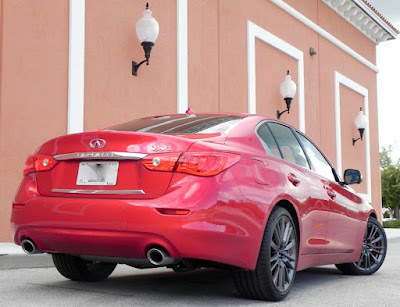 Thus when a red 2017 Infiniti Q50 sedan showed up in my driveway recently, it had me at first look. That it happened to the top-of-the-line Red Sport 400 trim just added to the anticipation. 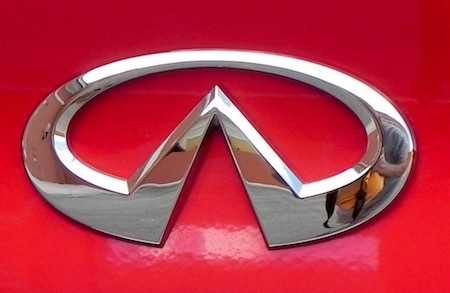 It wasn't a direct line from one to the other as there was the short-lived Q40 sedan, which the company took out of production in 2015 after one model year, kind of in between, and for a while the company sold both. But that’s how it has ended up. Whether it was a reluctance to accept the new naming system or genuine criticism, the Q40 and later the Q50 got a rather lukewarm reception among many reviewers, who preferred the G37 to the redesigned model that replaced it. Wards Auto called the 2014 Q50 not “a big leap forward over the G37” that it replaced but added that it wasn’t “all bad.” Edmunds.com praised it for its technological features and interior quality, but wasn’t as enthusiastic for its handling and ride quality. In its analysis of reviews, U.S. News & World Report rated it no better than No. 11 out of 20 luxury sports sedans. 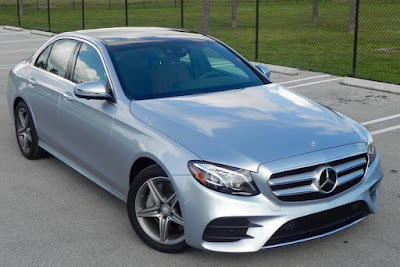 Though the competition is tough (Audi A4, BMW 3-Series, Mercedes-Benz C-Class, etc. ), I think that is underrating the Q50 a bit. Its exterior is striking, especially in what the company calls its new “Dynamic Sandstone Red” color, its roomy cabin coddles riders with high quality materials, and the response from the 3.0-liter, turbocharged V6 engine in the Red Sport model is equally up to the competition. That engine is rated at 400 horsepower and delivers 350-pound feet of torque to the rear wheels via a 7-speed automatic transmission that can shifted manually through paddles mounted on the steering column and also can be adjusted to Snow, ECO, Standard, Sport, or Sport-Plus modes depending on conditions or your own personal wishes at the time. It’s also available with all-wheel drive. A slightly milder version turbo V6 that is tuned for 300 hp and a 2.0L turbo 4-cylinder engine are also offered as well as a gas-electric hybrid drivetrain on other trim levels. EPA mileage ratings for the 2017 Q50 Red Sport 400 are 22 miles-per-gallon city, 26 highway and 22 combined, and premium fuel is required. Standard equipment on the Q50 Red Sport 400 includes automatic on/off LED headlights, LED fog lights, 19-inch wheels, leather-appointed 8-way adjustable sport seats with driver’s side lumbar support and side bolsters, dual zone climate control, rain-sensing windshield wipers, power sliding glass moonroof, rearview monitor, InTouch dual display system with two screens, Bose premium sound system, Bluetooth hands-free phone communications, and two USB connection ports. That’s included in the MSRP of $48,700. 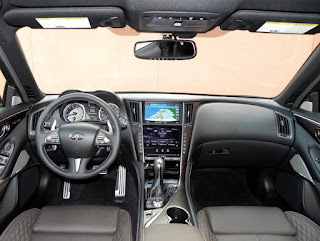 Other good stuff, like special seating, adaptable cruise control, blind spot warning and lane departure warning, Infiniti’s InTouch infotainment system with navigation, etc. 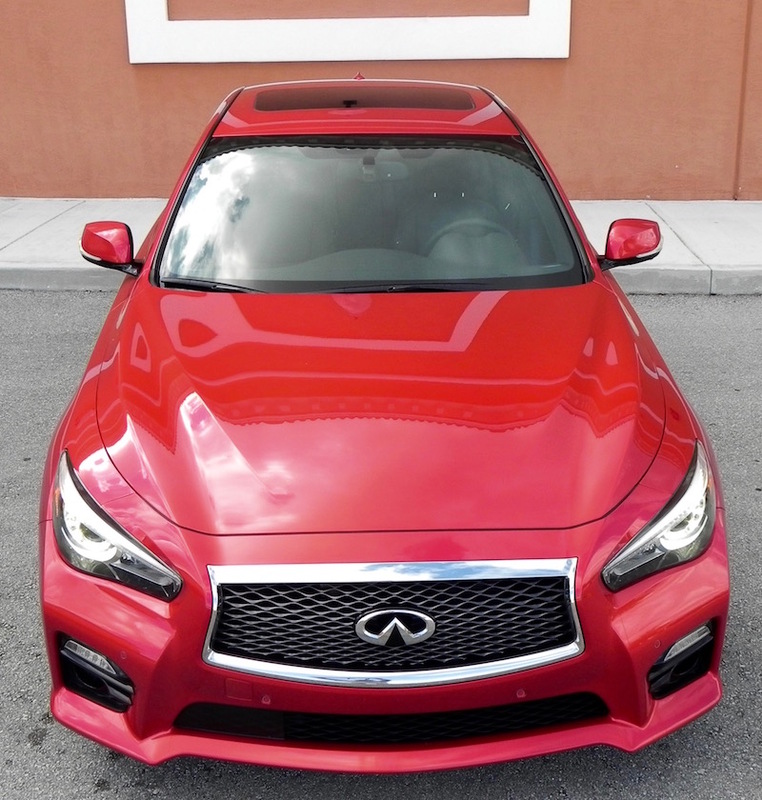 is available in option packages that, along with the $905 destination and delivery fee, ran the total cost of this 2017 Q50 Red Sport 400 up to $60,220. There are five other trims with the base starting at about $25,000 less. 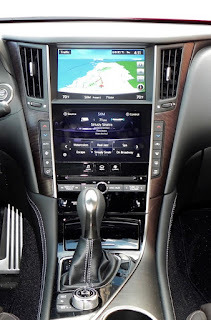 What I liked about the 2017 Q50 Red Sport 400: Other than the driving performance — the website zeroto60times.com clocked the 2016 Q50 Red Sport 400 in 4.5 seconds — I liked the idea of having two screens on the center stack. One displays the map for navigation and is operated by the knob on the console. The smaller, lower screen, is for audio, climate, and other functions. Being able to make adjustments without having to change screens is a nice touch that I have seen only here and on some Honda/Acura models. What I didn’t like about the 2017 Q50 Red Sport 400: The manual offered little in the way of help, and it took a while, but I finally figured out to change the clock from EDT to EST. There could be issues with instructions for other functions as well, but I find that this isn’t an issue exclusive to Infiniti but to auto owners’ manuals in general. Also, call me a traditionalist, but I don’t see what was gained in the name change from G37. 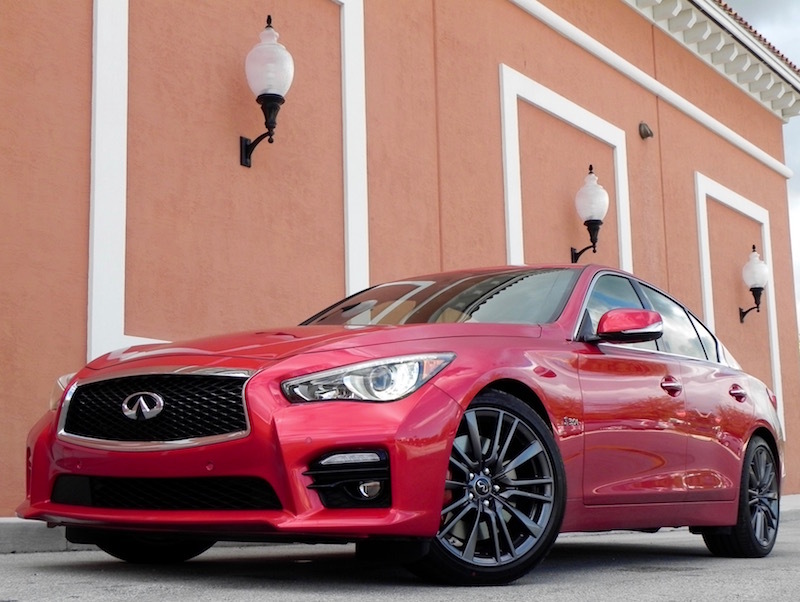 Would I buy the 2017 Infiniti Q50 Red Sport 400: It would be my choice from among the other trims for sure. And I would make sure it was red.